Elise Faolan is devastated when her parents are killed by Lycan hunters. Although against her nature, she joins her brothers in the hunt for their parent's killers. Instead of feeling relief when they are brought to justice, she is confronted with an arranged marriage, one she knew nothing about. Her choices are limited as to what she can do, so Elise runs. When Elise returns home to face her new husband, Elijah Terrence, she can't help but wonder if this bond of marriage will ensure her true love or will this stranger she has joined with become her enemy. Only time will tell, and Elise as well as Elijah must decide how they will meet any future hunters who seek to harm Elise. Their passionate journey to friendship, love, and survival will be one they will never forget. Thank you to Backlit PR, for the arc of this book in exchange for an honest review. I really enjoyed this book, two strong leads, and a different take on a paranormal romance which I liked. But I need more, so I am hoping there will be another book, I need to know about Natalie and Michael, and Lydia and Randy, and of course Elijah and Elise. 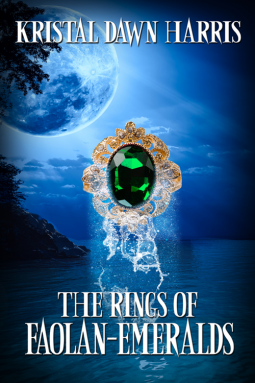 Kristal Dawn Harris has written an enjoyable paranormal lycan story in The Rings of Faolan-Emeralds. The lycan families are under threat and Elise is betrothed against her will to Elijah as both are alphas and the lycan counciil wants to protect the blood lines and lycan groups. Elise now finds on return to her home that her marriage has been officially sanctioned in her absence; now she must work out her relationship with her mate and fend off the threat from outsiders.